WORTH PROJECT PARTNERSHIP 2018 : AWARDED with Studio Bas Froon ! together with Boulezar german creative fashion brand. Contact us for unique made to measure EGGSHELL projects. Always looking to create new visual and tactile surprisingly sustainable material, the studio was honored to answer positively, with its ©SUPPLE MARBLE, to the French Innovathèque call of exhibition 'SO FLEX'. ©SUPPLE MARBLE is a range of incredibly supple and soft , but resistant, textiles made of real MARBLE, eco-friendly polymer and natural fibers. Its in-depth marble's pattern reproduce faithfully the marble's veins effects, in a range of natural marble colors. 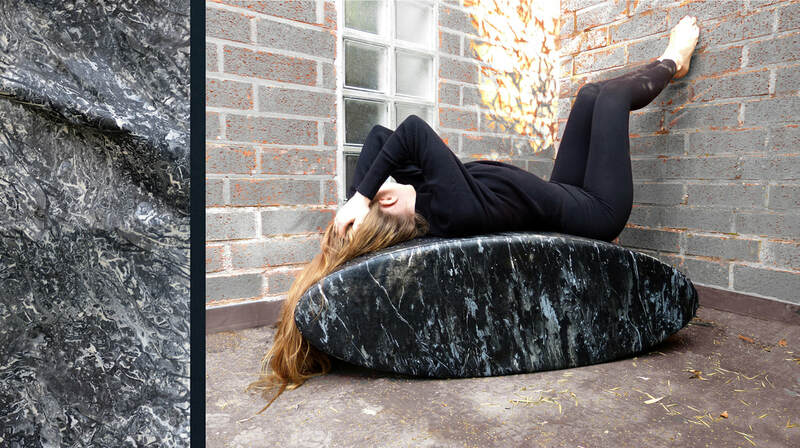 Contact us for unique made to measure ©SUPPLE MARBLE projects. 'SO FLEX' 2014, exhibition dedicated to innovative surprising supple materials, curated by Innovathèque, Paris. With a specific in-house laser cutting and digital disruptive know-how, the studio archieves the finest and original designs on wood, silk, and other natural fibers or materials, without any burning side effect. By combining high-end handcrafted manipulations, with digital artistic developments, Geneviève Levivier reinvent what industrial process means and can achieve in a local way of slow sustainable production. - A MATERIA DAS NUVENS - MuBe Musée de la sculpture de Sao Paulo, Brésil. - LA MATIERE dES NUAGES - Centre Wallonie-Bruxelles à Paris. curated by Première Vision Paris. LAUREATE AT CREATIVE BOOST-UP launched by Walloon Region and Wallonie Design. curated by SPI , Belgium. The story of the studio begon in 2008 with the Polymer Lace, adopted by one of the most renowned parisien Couture House for its PE 2009 Fashion Show and collections. This 3D effect eco-friendly polymer lace, took 2 years of R&D to achieve delicacy, suppleness , softness , and non allergenic skin applications... In parallel to her Polymer Lace creations dedicated to Couture Houses, Geneviève Levivier created large format Polymer Tapestries, international exhibited. ​launched by Walloon Region and Wallonie Design. launched by Première Vision Paris. 'TEXTILES, Innovations et Matières Actives' , a book from Florence BOST et Guillermo CROSETTO; éditions EYROLLES.